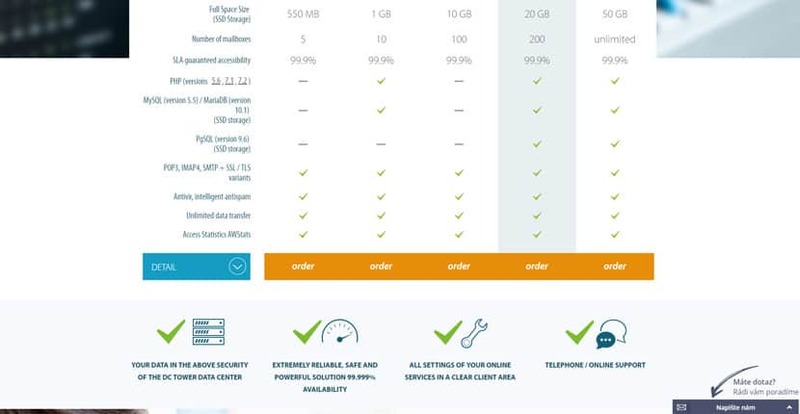 Web4U Review 2019: Is Web4U a Good Hosting? Web4U is a Czech web hosting provider with lightweight and affordable albeit restrictive budget shared hosting plans. Their PHP and ASP.NET plans may be particularly appealing to developers. Web4U is a web hosting vendor based in the Czech Republic, though they also serve customers in several other countries such as Slovakia, Germany, Poland, and Ukraine. The company was founded in 2003 and at present their service is only available in Czech. Web4U also has a ASP.NET hosting plan for those who require a Windows operating system. In addition to the above features, Web4U includes a one-click installation tool for scripts like Drupal, WordPress, PrestaShop, and Joomla!. You also get a free .cz domain registration with the purchase of an annual contract, making Web4U an excellent one-stop solution for Czech webmasters. If you outgrow their shared hosting plans, you can easily scale up to their VPS or dedicated server packages. They also have fully-managed options for customers who’d rather hand over all website-related operations to hosting professionals. Web4U uses SSD storage with RAID configuration for complete redundancy. The company uses a decentralized hosting model that ensures that the failure of one server doesn’t threaten to bring down the whole system or affect the performance of any other server. While these features are helpful, they’re the typical features companies in this space would offer. The differentiating factor, therefore, isn’t what the company claims to offer, but how well their resources serve their customers. By and large, Web4U customers show considerable satisfaction with their hosting solutions. All hosting services from this vendor – including VPS and dedicated servers – are extremely cheap. Note that all prices are listed in Czech Koruna (CZK), so you may have to do some currency conversion. The vendor also allows potential customers to try out their servers with a non-obligatory 21-day free trial. This, apparently, takes the place of any refund policy: Web4U doesn’t offer a money back guarantee. You can reach Web4U’s customer support via live chat, a contact form, or email. Phone support is also available, but only during business hours on weekdays. For server-related emergencies, Web4U encourages their customers to use their IPMI or VNC console. When I contacted the Web4U support team about installing phpMyAdmin using Virtualmin, the support representative sent me clear and easy-to-understand instructions via email. This took less than an hour, which was impressive. The hosting company doesn’t have a ticketing system, but their knowledge base is loaded with many articles and tutorials covering most of the issues you’re likely to come across using their services. Web4U’s solutions are primarily designed for small to mid-sized business websites that don’t have very high resource demands. They’re not the most beginner-friendly, but they’ll get the job done. Wondering how Web4U stacks up against other Web Hosting companies? Enter any other Web Hosting company and we will give you a side-by-side comparison.